Like food and shelter are to Maslow’s Hierarchy of Needs, Phase 1 HCM needs are fundamental to successful existence for any organization. An HCM implementation ensures these needs are fully met first. Even mid-sized companies can struggle with Phase 1 needs and can find themselves in a fight for their lives. This can be due to growth spurts, mergers or acquisitions. Growth in employee counts, geographical footprint or revenue, all subject the company to governmental regulations including the Affordable Health Care Act, multi-jurisdictional taxation, and wage and hour law requirements, which strain an over-committed and growth-oriented management team. Spreadsheets, small-business payroll outsourcing and paper approvals are overwhelmed by sheer volume, inefficient procedures and duplicate processing. Information is lost, entered into systems multiple times, or otherwise inaccessible, inaccurate and/or ignored by managers. I’ve seen first-hand how disruptive Wage and Hour or Department of Labor audits can be without the underlying recordkeeping to properly support the company; a costly event in precious time, legal fees, and fines. I have also witnessed dishonest employees and managers falsifying timesheets and payroll records literally robbing a company of payroll funds for years. Those management teams were preoccupied with growing the business and just didn’t have the proper HR systems in place to protect their company adequately. Make no mistake that organizations with Phase 1 needs can be exciting companies with an impressive growth story, compelling products and services, and a management team engaged in fueling the rocket with talent and capital. And often those same managers are savvy enough to recognize that to continue their impressive growth story hinges on fixing these foundational HR issues. A system to facilitate daily collection of time and labor (biometrics as needed) with manager oversight and approval directly fed to payroll. Enterprise level payroll processing with the controls needed to ensure proper federal, state, and local taxation and labor allocation broken out by the needs of the company, whether that be by location, department, project, job, and/or task. That information is ultimately reportable and fed to the general ledger so the organization has a true picture of its spending in the various areas of its business. HR recordkeeping practices are transitioned from small-business payroll, spreadsheets, and paper to an electronic system so this information is touched once and compliant with governmental regulations and can be managed efficiently. Phase 2 is largely about workflow automation and can account for a good portion of the return on investment projected for the entire HCM project. Paper processes and duplicate work are transitioned to a vastly more efficient framework of system workflows and notifications. The organization benefits greatly by using Employee and Manager Self Service as data entry and approvals can be handled one-time and at their point of origin. Employee adoption of self-service is key to this phase and will likely require cultural reinforcement from top management. Employee Self Service allows employees to help themselves via a mobile device or web browser to view or modify information about themselves, including time-off requests, timesheets, compensation, and benefits. This feature reduces the demand for HR and managers to service enquiries from employees. Manager Self Service empowers supervisors to manage information for their direct reports via a mobile device or web browser and to approve requests for time-off, payroll, benefit, or schedule changes online and in real-time. System workflows and notifications streamline approval processes that are uniquely programmed to adhere to company policy, inform all relevant decision makers and collect electronic approvals. 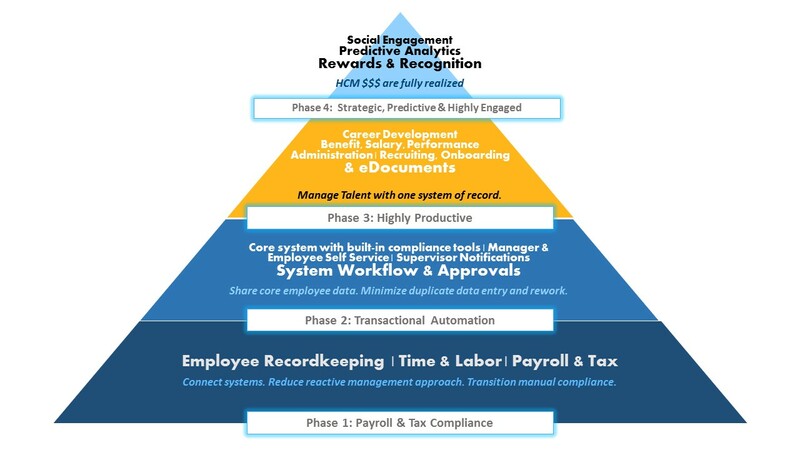 Phase 3 is about Talent Management features such as Recruiting, Onboarding, Benefit Enrollment, Performance Management, Salary Administration, and Career Development. Each of these capabilities addresses a specific area of the Human Resource function with a mobile and web-based capability to engage employees and supervisors in administering this work conveniently and efficiently. Careful attention must be paid to the foundational system workflow policies to ensure that the companies underlying HR policies are respected at all times. Recruitment features include branded candidate mobile and web portals for job seekers, assessment and review tools for hiring managers, and system workflows to guide candidates through the process of completing job applications, screening questionnaires, interviews, and ultimately the offer process. Onboarding walks a newly hired employee through the hire process, collecting relevant information and signatures for hiring paperwork. eDocuments eliminate the paper documents and replace them with a mobile and web-based presentation and repository system that records signatures and document versioning. Performance management provides for talent assessments, performance reviews, and succession planning with employee, supervisors, directors, and peers all engaged in the feedback loop. Salary Administration distributes salary increases and bonus assignments across the entire organization respecting department, division or location budget requirements and engages the decision-makers with a multi-step approval process. Once all sign-offs are made, the system records employee and payroll changes seamlessly. Automate Benefit Administration using online enrollment, carrier eligibility feeds and billing reconciliation tools. Employees enroll in benefits online and changes in those enrollments are conveniently fed to carriers electronically. Phase 4 is for the most committed, sophisticated, and engaged management teams. These organizations consider human capital vital and invest accordingly striving to achieve a highly-productive workforce that is highly-engaged, and this can be an elusive goal. It’s not as simple as implementing system features. An employee engagement philosophy of teamwork, collaboration, rewards, and recognition is vital along with a management commitment to transparency to the drivers of the business. And the benefits can be tremendous with productivity gains and improved employee retention. It’s a simple fact that recognition, now distributed and administered by the system, can play a big part in employee retention and productivity. As Tom Peters co-wrote in Excellence, “…the simple act of paying positive attention to people has a great deal to do with productivity.” The Social HCM acts as both a conduit for teamwork and collaboration, and it speeds the feedback loop between project stakeholders and contributors to help keep projects and people on track. Predictive Analytics provide a real-time, deep, and intuitive understanding of your organization and transparency to reveal the drivers of the business. Social Collaboration features foster an engaged workforce enabling employees to easily build relationships, cross-collaborate, learn, share knowledge, and ultimately improve productivity. Recognitions and rewards capabilities provide a framework for consistent, fair and public recognition to those deserving such accolades. Automation of badging and awards with points tracking removes the chore of reconciling points for redemption of gifts or other company rewards. This phased methodology makes transitioning to a strategic, predictive, highly-productive, and highly-engaged workforce an orderly and controllable process. Of course, getting to the top of the pyramid requires real commitments to transparency and a philosophy that engages and rewards employees. For organizations that aspire to be strategic, predictive, highly-productive, and highly-engaged, a modern HCM is just too compelling of a technology for those businesses to ignore. The Corporate Psycho is an individual who systematically lies, coerces, intimidates, or otherwise instills fear in coworkers in the pursuit of power within an organization. Hiring this person is your worst nightmare. They look great on paper and maybe their references even check out, but you will wish—no you will pray—that you didn’t hire them. And once part of your team, the psychopath will systematically and maliciously agitate and sabotage the efforts of coworkers. The Corporate Psycho is a predator and you are its prey. The Corporate Psycho has a self-serving agenda with no moral compass. They systematically oppress individual contributions with the intent to disrupt productivity and foster malcontent. They are deceitful and insincere in their relationships and communications. Once inside your department, the Corporate Psycho will destroy the quality of your work life and relationships by undermining the key ingredient to a functional workplace: TRUST. Once in the throes of chaos created by the Corporate Psycho, coworkers lack trust and confidence in each other. Finger-pointing and assessment of blame thrive. New challenges and problems surface, and nothing seems to work like it used to. Even the things that were easy are now hard. Productivity drops, deadlines are missed, quality suffers, negativity thrives, absenteeism skyrockets, and most good people move on to greener pastures. And then your department suffers more as it is placed under the microscope of upper management. That was the Corporate Psycho’s plan all along: to create the chaos and then take advantage of that chaos. What makes the Corporate Psycho so treacherous? They are psychopaths and very skillful liars, and they believe that their views of the world are more enlightened than others. They have total disregard for people and treat them as a means to end. They befriend only as a means to gain information and power and then use this information to disrupt order and promote their own agenda. Once the workplace is in chaos, they win over vulnerable leaders by promoting an insider’s view of how things really are going in-the-trenches. Only they are misleading leaders with lies peppered with just enough truth to seem credible and actionable. And the cost of the Corporate Psycho is substantial. According to Cornerstone OnDemand, good employees are 54 percent more likely to quit when they work with a toxic employee.3 Replacing employees is expensive and for skilled workers can easily exceed $10,000 per hire. How do you defeat the Corporate Psycho? The key to defeating a Corporate Psycho is to recognize the agenda early and to disrupt any maniacal plans. Does this individual proclaim to be a rigid follower of protocol but in reality is not? Does this person seem overconfident and display a superiority complex with others? Are they willing to do whatever it takes to ascend in the company? Is there a general disregard for others’ contributions? Does this person take credit for others’ work? Does this person generally take issue with authority? 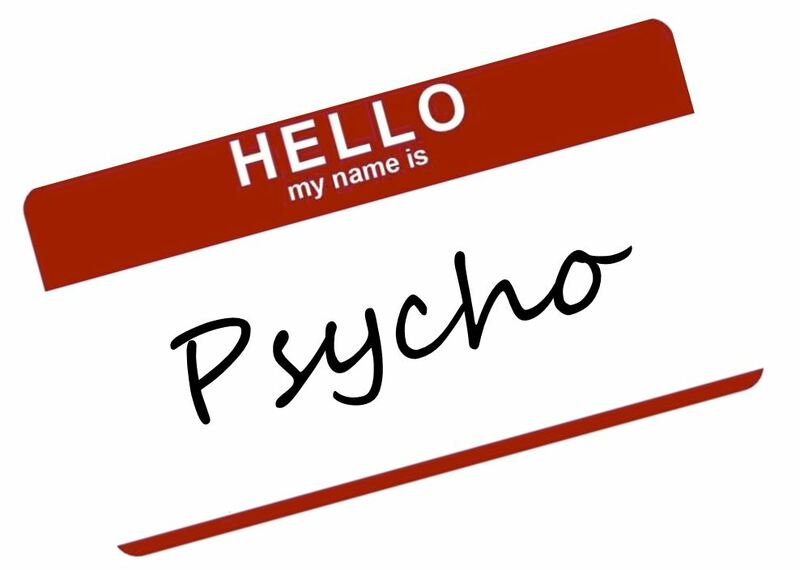 Once a suspect is identified as a potential Corporate Psycho, govern your behavior accordingly. Don’t be bullied. The Corporate Psycho needs your help to promote an agenda, so don’t be a victim. If you suspect you are working with a Corporate Psycho, don’t accept advice or share information, unless it is a requirement of your job. Keep your distance. The inner workings of your job and the difficulties of your workday should be kept between you and your boss. Be sure not to put the Corporate Psycho in a position to fight battles on your behalf with your supervisors. They will not represent your best interests. And resist the temptation to get baited into negativity directed to the company or other coworkers. Document everything. When dealing with a suspected Corporate Psycho, document every exchange with this person. Keep a log by writing down the time, place, and detailed notes so you can reconstruct the substance of your meeting. Remember, this person is a psychopath – he/she will not expect you to document your interactions as they view you as too “weak” to foil their plan. When things get chaotic you’ll be glad you documented because you will be in a position to justify your actions with your supervisors. PsychVisit.com. “Course and Prevalence of Antisocial Personality Disorder and Psychopathy” http://www.psychvisit.com/conditions/antisocial-personality-disorder-psychopathy/5-course-antisocial-personality.html (accessed 23 Nov. 2015). Susan Sorenson and Keri Garman. “How to Tackle U.S. Employees’ Stagnating Engagement,” Gallup, 11 June 2013, http://www.gallup.com/businessjournal/247/high-cost-disengaged-employees.aspx. Cornerstone OnDemand, “New Research Exposes the Hidden Costs of ‘Toxic Employees,’” 31 March 2015, https://www.cornerstoneondemand.com/news/press-releases/new-research-exposes-hidden-costs-toxic-employees. Robert Tucker, Innovation is Everybody’s Business: How to Make Yourself Indispensable in Today’s Hypercompetitive World (Hoboken: Wiley & Sons, 2011), 157. It’s really not about ageism. It is simply that a great attitude and passion to succeed trump years of experience and perfect qualifications nearly every time. Most recently with an economic recovery underway, I’ve seen more expert candidates apply for jobs in the past year than ever before. And you’d think that would be a good thing, right? A perfect match between a job seeker’s past work history and the job requirements seems like a perfect hire. But I’ve witnessed seemingly perfect job candidates become under-performing employees. I’ve seen this enough times that a seasoned candidate is now a red flag. My best hires have almost exclusively been individuals who viewed their new job as a growth opportunity and worked very hard to be successful. And my more memorable worst hires have been those who seemed heavily qualified but yet fell short of expectations after being hired. So why do these seemingly seasoned hires fail to thrive? #1 reason – hiring managers are so focused on the technical match between the candidate’s past experience and the job requirements that they shortcut or deemphasize the rest of the recruitment evaluation process. It is huge rookie mistake, and I’ve made it myself. We become so enthralled by the possibilities of hiring the hit-the-ground-running, take-me-to-the-promise-land job prospect that we overlook the candidate’s shortcomings in terms of organizational cultural match, willingness to learn, and overall attitude. #2 reason – our expectations are too high for the seasoned veteran’s performance. The seasoned veteran is short-changed on job training and knowledge transfer. The idea is that they really don’t need it, right? They already know what they are doing. Just look at their résumé. That is just wrong because different companies have different ways of doing things, and you can’t assume that a seasoned pro will be able to translate 100% of his/her skills from one company to another. #3 reason – we undermine peer support. We position our seasoned new hires in a way that threatens peers and coworkers. They then gather no support and are left to die on the vine. Seasoned hires are often viewed as a threat to job security within a department or organization, so it is imperative that you ensure that each new hire is embraced and socialized adequately. #4 reason – our seasoned new hire can carry some unwanted baggage and can be difficult to manage. I characterize these overconfident hires as overzealous in their contributions and opinions, unwilling to learn, and often lacking motivation or drive. I’ve seen and heard it all from this group. From “been there done that, so I’m not going to try it again”, “it’s worked my way just fine for 25 years” (whether the new hire is 25 or has 25 years of experience), or my favorite is the “I do not need to be told by some 20-something how I should be doing my job”. Organizations only thrive when teamwork, knowledge transfer, and learning are part of the work environment. So how to avoid this? One can’t just disqualify a seasoned pro. That wouldn’t be fair or even legal. Balance the technical match of skills to job requirements more evenly with assessments of your job candidates regarding organizational cultural match, ability to learn and adapt to change, leadership qualities, etc. Carefully evaluate every candidate’s individual motivational factors. The best hire will often have something to prove. He or she is motivated to do a good job and be noticed. Access what will drive each of your candidates to perform, and this should help you more wisely choose who to hire. Don’t always hire the smartest guy in the room, especially if that person is convinced he or she is the smartest. A better candidate is the one that demonstrates the ability and willingness to learn. These skills will serve your organization better longer term than any accumulated knowledge that a candidate may seemingly have. 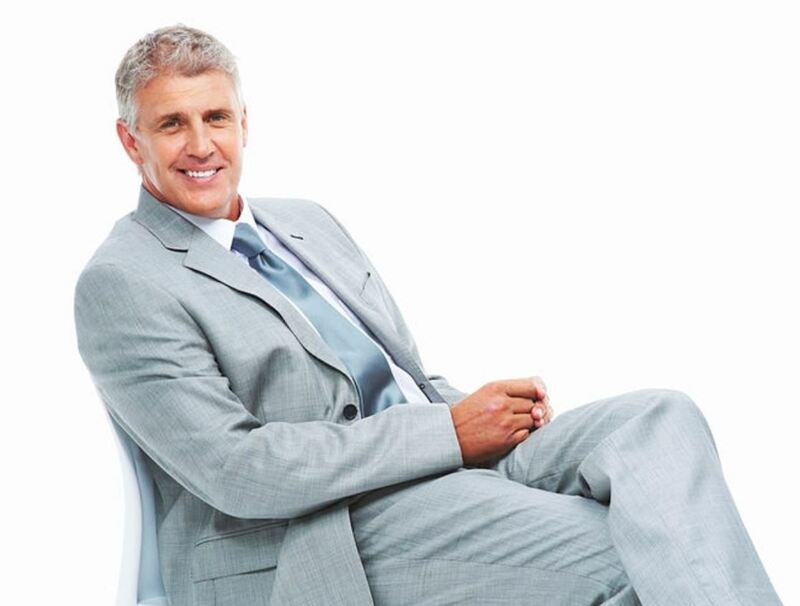 The next time you are considering hiring a seasoned candidate, I recommend sticking to a balanced evaluation process that does not over-emphasize the technical needs of the job and being mindful of the need to support your seasoned new hire with the same training and internal support as your other employees. What does a project with a tight delivery timeline, too many competing work priorities, and conflicting personal and work commitments have in common? They can all contribute to that feeling of being overwhelmed, and they can ultimately lead to job burnout. And job burnout is not a place you want to go to. It’s a cake made of unhappiness, filled with exhaustion, and topped with resentment. It’s dark and cold place where one bad day hopelessly leads to the next even worse day. Over the course of my career, I’ve seen firsthand how burnout can turn the positive, organized and productive into negative, chaotic, and ineffective. And, I’ve found five principles to help team members turn it around before it becomes burnout. 1. Given a project with a tight delivery timeline, get organized and in control of your day. How do you eat an elephant? One bite at a time. Prioritize and break down your assignments into realistic schedules with tasks of a manageable duration: not exceeding two or three days. Don’t overcommit. Then review your plan and get buy-in from your supervisor. That way when your supervisor asks, “How are you progressing,” you can refer to your approved plan and respond with confidence and detail. 2. Pulled in too many directions: Focus on eliminating distractions, prioritizing, and delegating. Prioritize your activities on a daily basis. Make a daily list of must-do’s, should-do’s and would-like-to-do’s. Then follow this daily plan to guide your activity. Mark off the finished tasks and carry forward the unfinished ones. Do this each and every day and keep these lists for future reference. 3. Allow others to contribute by delegating and working in teams. I’ve yet to see a “Me, myself and I” company award. Most organizations value teamwork and collaboration over individual contributions. As Petra Cross from Google once said, “…you need to use your soft skills to be able to work well with a variety of people,” and “You need both, good people and good idea.” 2 What is most important to your success is the success of your assignments, so you should always fully use your organization’s resources to complete your assignments. Ask your supervisor with help prioritizing your assignments. Be organized and prepared to walk through detailed work plans and documentation on how you see tackling the workload. Your goal is to clarify your supervisor’s expectations and to gain a better understanding on how your supervisor envisions your assignments. 4. Focus on positive change that you can make happen. Keep your attention and focus on the positive change that you can make happen and not on change that is out of your control. It’s worthwhile to offer your opinion on ways your organization can improve. The trick is not to get overly optimistic about your influence in areas where you are not directly responsible. Organizations are complex, and change can be difficult and slow to implement. The best way to make your opinion count is to excel at your job and be a positive influence on those around you. 5. 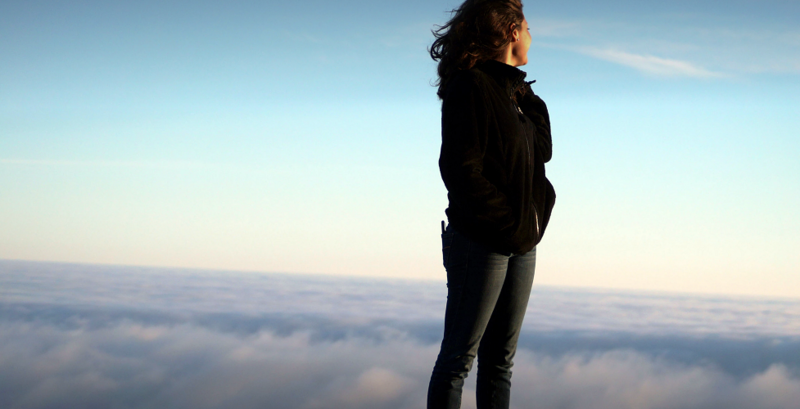 Re-balance personal commitments and work commitments. Do you have personal commitments conflicting with job responsibilities or vice-versa? If you’ve followed my earlier advice on breaking your assignments down and planning, minimizing distractions, and delegating, work-life balance may be one step closer already. Make peace between work and other aspects of your life since both are essential to your wellbeing. Plan your workdays and workload around beginning and stopping work at designated times. And then stick to your plan. If you have important personal commitments spilling into work time, see if you can use time off or other benefits to get caught up. Avoid burnout before the situation spirals you out of control. Recognize the warning signs of feeling overwhelmed. Then, take action by getting organized, eliminating distractions, delegating, remaining positive, and‒very importantly‒balancing your life. 1 Gothelf, Jeff, “Four Qualities of Successful In-House Innovation Teams: Considering the ‘Two Pizza Team,’” O’Reilly Programming, 2 July 2013, http://programming.oreilly.com/2013/07/four-qualities-of-successful-in-house-innovation-teams.html (accessed 26 Feb. 2014). 2 Atagana, Michelle, “Senior Google Engineer: Building Innovative Products Requires Team Work,” Memeburn, 9 Oct. 2013, http://memeburn.com/2013/10/senior-google-engineer-building-innovative-products-requires-team-work/ (accessed 25 Feb. 2014).